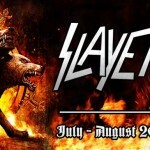 On July 12th, Slayer, Lamb of God and Behemoth are begin a monumental North American tour. Unfortunately, due to personal reasons, drummer Behemoth will not be on tour. Fortunately not for health reasons or other problems. As officially announced Behemoth team, Inferno will not go on tour due to the birth of second child. The drummer will remain at home to spend time with his family and therefore refrain from participating in the tour. We’re congratulate Inferno, and wish a Behemoth a successful tour alongside the legendary Slayer and Lamb of God! © 2012-2019 life4sound.pl. All rights reserved.